We were one of several involved and given simple joyous task of decorating a thirty centimetre patch for worthy cause. 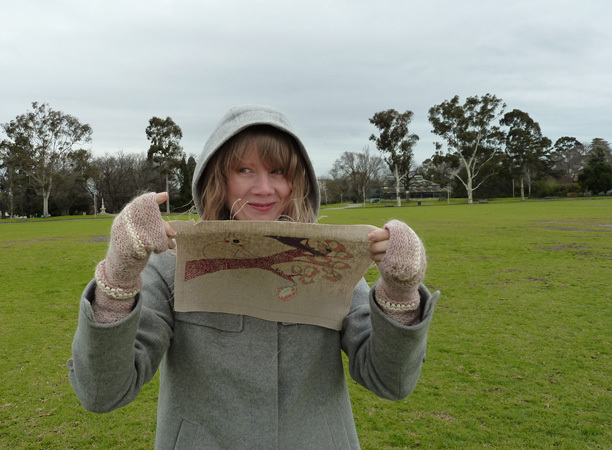 For our square, we embroidered a rabbit and placed him upon a tree in riot of blossom. Lest he be lonely up there in the unfamiliar, we gave for company a purple bird. 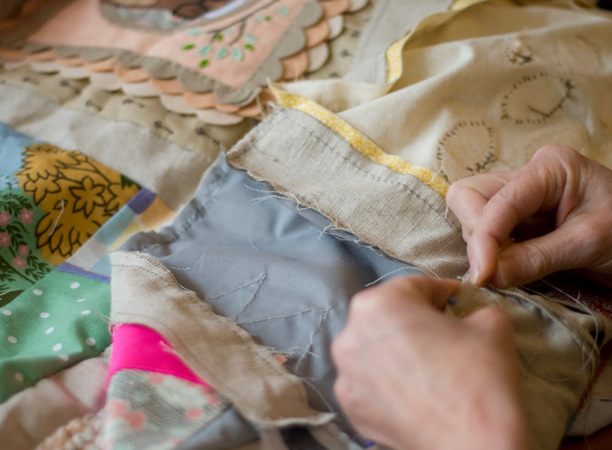 A collaborative quilt project made to raise money for the Australian Cambodia Foundation. The raffle night for the three finished quilts was held at Craft Victoria (18th of October, 2010). Everyday I come home from work and race to the mail box, hoping to find it filled with patches and today I was so very excited when I saw an envelope from Gracia + Louise! I knew when I opened it I would find something beautiful so, like charlie with his chocolate bar, I unwrapped it very slowly. Meanwhile, the girls I live with were yelling at me telling me to hurry up and rip it open. I was right, the girls have absolutely blown me away, as expected, with a very very gorgeous patch! Melbourne girls, Gracia Haby and Louise Jennison are a duo that work closely together making a range of beautiful creations some of those being; artist books, zines, prints, postcards, pencil cases, cards, journals & dolls. They are widely skilled and make just the most amazing and inspiring work. At my work we have a Gracia + Louise collage hanging up on the wall right in my eye line and I get stuck staring at it. The wild worlds Gracia + Louise create with paper, watercolour and collage really do take you to another place. Under the name of Hammer & Daisy the two also make the most special dolls and creatures as well as a range of beautiful stationary. Each one hand crafted, each one beautifully individual. They are sewn together with beautiful fabrics, buttons, patches and beads. They are definitely individual little personalities that you would expect to come alive at night (in a whimsical non scary way).